For decades, the U.S. government’s Bureau of Land Management (BLM) has been rounding up America’s horses because they graze on public land coveted by powerful cattle ranchers. The BLM uses “rangeland health” to justify the roundups, but the 30,000 some odd horses who remain pose no threat to the land compared to the millions of cows and sheep who graze on it. Our insatiable appetite for meat is killing America’s remaining wild horses, but passionate advocacy groups from around the country are moving mountains to protect those who remain. 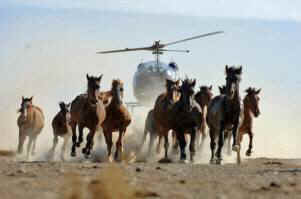 During a typical roundup, the BLM uses low flying helicopters to chase the terrified horses into traps. According to Edita Birnkrant, the Campaigns Director for Friends of Animals, “Families are torn apart during the roundups, separating foals from their mothers, and the captured horses are imprisoned in squalid holding facilities where their fates are unknown. 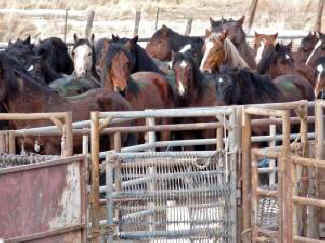 “Today, over 47,000 horses are being held captive, and the BLM is poised to use tax dollars to kidnap the remaining 30,000 on behalf of the meat industry. According to FOA, six states have already lost their wild horse populations. In an effort to protect the remaining horses, Friends of Animals and the Cloud Foundation have petitioned the U.S. Fish & Wildlife Service (USFWS) to list them as “threatened” or “endangered” under the Endangered Species Act (ESA), and the organizations are prepared to pursue legal options if the USFWS does not comply. America was built on the backs of horses. They are a national treasure, and we must do everything in our power to protect the few who remain. Please take action today - Express your Disgust with the Wyoming roundups and read Endangered species status is only hope for Wyoming’s wild horses.